This Southwest Pasta Salad with creamy Cilantro Ranch Dressing is the perfect way to enjoy the last few weeks of summer. I always start to get a little panicky this time of year. The weather is cooling down, which has led to some truly gorgeous days. Mid-70s, breezy, partly sunny. Perfection. But instead of simply enjoying the loveliness, I find myself frantically packing our schedule with all the summer related activities we can cram in. More pool days. More zoo trips. More spraygrounds. More ice cream. More swing sets. More. More. More. This past weekend, I started reading Present Over Perfect by Shauna Niequist. In a season where I’ve been wanting more, this book is decidedly about less. Less pressure. Less accomplishing. Less pushing. Less doing. More quiet. More contentment. More enjoying the mundane, ordinary days. In this season, I’m trying to remember that time is not the enemy, and neither is winter. My real enemy is worry, that panicky voice in the back of my head that tells me a day not spent doing something monumental is a day wasted. There is plenty to enjoy in this present moment, whether it’s sunny or pouring rain, whether I’m playing on the floor with my son or on an adventure at the zoo. There is joy to be found in lazy Sundays. In family naps. In flipping pancakes and banging on pots and pans. And the joy of the present isn’t something that’s only available on beautiful summer days. It’s available each day I’m willing to put down my phone, my calendar, and my to-do list and be present with the people I love most. 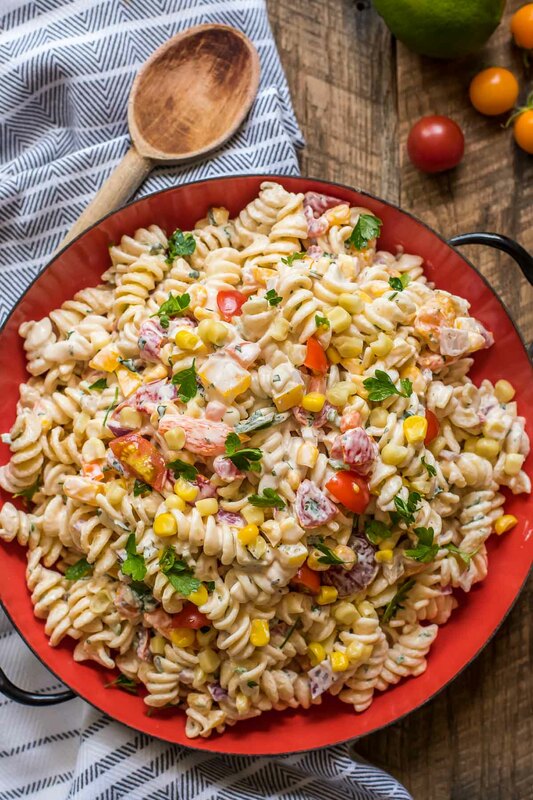 This Southwest Pasta Salad is a lovely little dish that’s easy to make and perfect for whatever ordinary or extraordinary moments you might be celebrating as the summer closes. 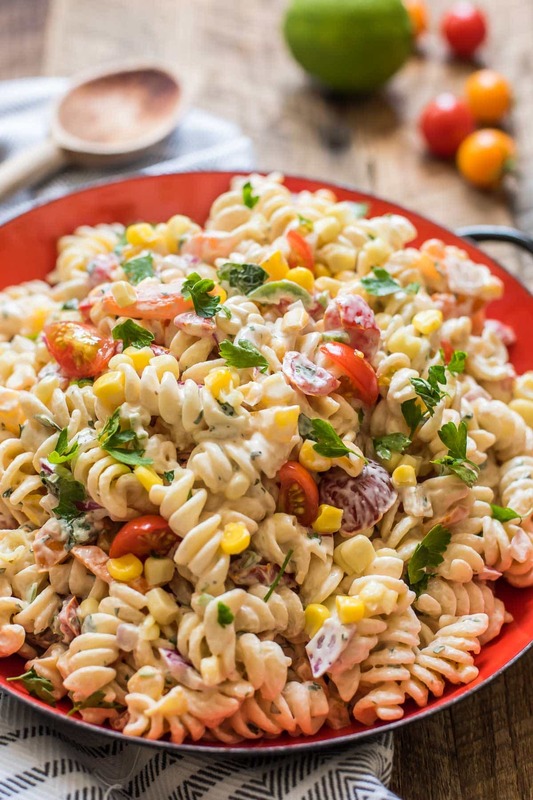 It’s packed with the best this season has to offer–juicy cherry tomatoes, sweet corn, and crisp bell peppers all tossed in a creamy cilantro ranch dressing. 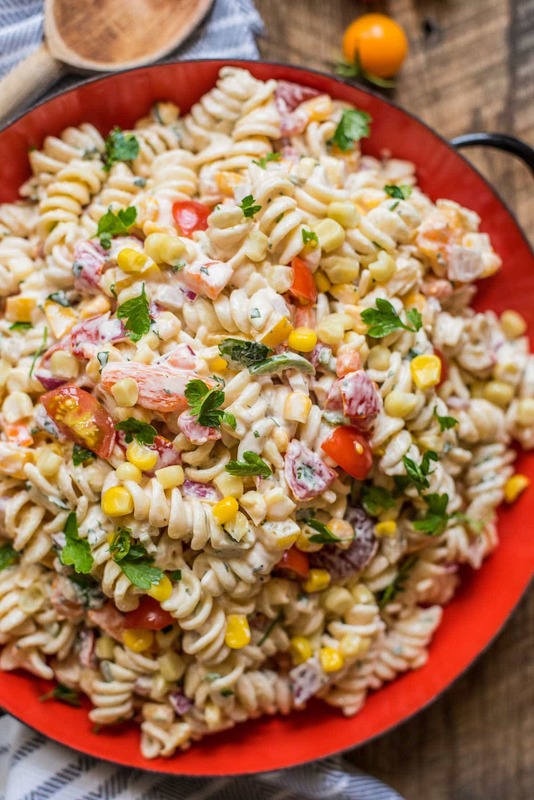 I fell in love with this cilantro ranch dressing when I made this Tomato and Corn Chopped Salad last summer, and it plays equally well with this pasta salad. Let me whisper a little cheat for you here, though. If you need less stress and more family time, you can totally go to the store and grab yourself a bottle of cilantro ranch dressing and just pour it on top. No judgment here! I’d love for you to make this pasta salad, but more than that, I’d love for you to show up and be present for your life, whether that means taking a much needed rest day at home or going to an end of summer shin-dig, pasta salad in hand. Take the time to savor these last days of summer. I’ll be doing the same. Cook the pasta according to package directions. Drain the pasta then run cold water over it to cool it down. In a large measuring cup, whisk together the mayo, sour cream, jalapeno, lime juice, cilantro, chives, and garlic. Splash milk into the mixture until it is pourable. Taste and season with salt and pepper. Toss the pasta with the dressing and vegetables. Refrigerate at least an hour, preferably several hours. Serve cold. Note: This post may contain Amazon affiliate links. A portion of any purchase made will come back to support the ongoing maintenance costs of this blog. 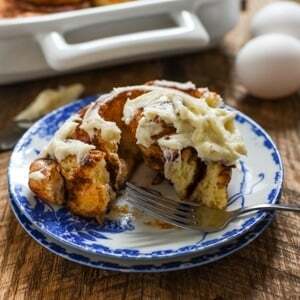 Thanks for helping keep NeighborFood afloat! 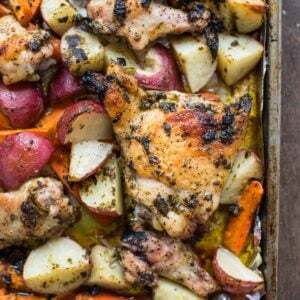 Made this today and it was amazing- easy and delicious. Thanks for a great recipe!